The nice thing about Nobel Prizes is that it gets easier to predict them every year, simply because most of the people you nominate don't win and automatically become candidates for the next year (note however that I said "easier to predict", not "easier to correctly predict"). Having said that, there is a Bayesian quality to the predictions since the previous year's prize does compel you to tweak your priors, even if ever so slightly. Last year's award was for a biophysical instrumental technique so that probably rules out similar awards this year. Harry Gray and Steve Lippard: For their pioneering and foundational work in the field of bioinorganic chemistry; work which has illuminated the workings of untold number of enzymatic and biological processes including electron transfer. Stuart Schreiber and Peter Schultz: For their founding of the field of modern chemical genetics and their impact on the various ramifications of this field in chemistry, biology and medicine. John Goodenough and Stanley Whittingham for lithium-ion batteries: This has been on my list for a long time. Very few science-based innovations have revolutionized our basic standard of living the way lithium-ion batteries have. However, prizes for devices have been few, with the charged-coupled device (CCD) and the integrated circuit being exceptions. More importantly, a device prize was given out just last year in physics (for blue light-emitting diodes) so based on that Bayesian argument stated above, it might make it a bit unlikely for another device-based invention to win this year. Franz-Ulrich Hartl and Arthur Harwich for their discovery of chaperones: This is clearly a discovery which has had a huge impact on our understanding of both basic biological processes as well as their therapeutic relevance. I worked a bit on nuclear receptors myself during a postdoc and appreciate the amazing complexity and importance of their signaling roles. However, as often happens with the chemistry prize, this one could also go to medicine. Alexander Pines for solid-state NMR: Another technique that has clearly come of age. Using our Bayesian ruler again though, last year's chemistry prize went to an instrumental technique (super-resolution electron microscopy) so it seems implausible to have the same type of prize given out this year. In the world of biopolymers, oligosaccharide synthesis has always been an important field which in my opinion has received the short end of the stick (compared to the glamorous world of proteins and nucleic acids, lipids and carbohydrates have always been the black sheep) so recognizing Wong might be a kind of redemption. On the other hand, recognizing Caruthers for DNA synthesis (perhaps along with Leroy Hood who automated the process) seems to be an obvious honor in the Age of Genomics. There are two sets of questions I have about it though: Firstly, whether an award for it would still be rather premature. While there is no doubt as to the broad applicability of CRISPR, it also seems to me that it's rather hard right now to apply it with complete confidence to a wide variety of systems. I haven't seen numbers describing the percentage of times that CRISPR works reliably, and one would think that kind of statistics would be important for anyone wanting to reach an informed decision on the matter (I would be happy to have someone point me to such numbers). While that infamous Chinese embryo study that made the headlines recently was quite flawed, it also exposed the problems with efficacy and specificity that still bedevil CRISPR (these are problems similar to the two major problems for drugs). My personal take on it is that we might have to wait for just a few more years before the technique becomes robust and reliable enough to thoroughly enter the realm of reality from one of possibility. The second question I have about it is the whole patent controversy. Generally speaking Nobel Prizes try to stay clear of controversy, and one would think that the Nobel committee would be especially averse to sullying their hands with a commercial one. The lack of clear assignment of priority that is being played out in the courts right now not only tarnishes the intellectual purity of the discovery, but on a more practical level it also makes the decision to award the prize to all three major contenders (Doudna, Charpentier and Zhang) difficult. Hopefully, as would be fitting for a good novel, the allure of a Nobel Prize would make the three protagonists reach an agreement to settle their differences over a few beers. But that could still take some time. Craig Venter, Francis Collins, Eric Lander and others for genomics and sequencing: The split here may be pretty hard here and they might have to rope in a few consortiums, but as incomplete and even misleading as the sequencing of the human genome might have been, there is little doubt that it was a signal scientific achievement deserving of a Nobel Prize. Alec Jeffreys for DNA fingerprinting and assorted applications: Alec Jeffreys is another perpetual favorite on the list and one whose invention has had a huge societal impact. A brief note on the physics prize: There is no doubt in my mind that the Nobel committee needs to give the prize this year to the ATLAS-CMS collaboration at the LHC which discovered the Higgs boson. 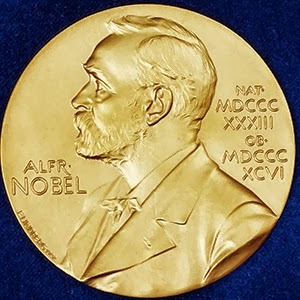 A prize for them would emphasize several things: it would put experiment at the center of this important scientific discovery (there would have been no 2013 Nobel Prize without the LHC) and it would herald a new and necessary tradition of awarding the prize to teams rather than individuals, reflecting the reality of contemporary science. So that's it from my side. Let the games commence! Note: Reader artqtarks has a list, with a thoughtful analysis of potential prizes for CRISPR and tumorigenic genes. I hope Harry Gray and Steve Lippard will win the prize. But, I feel like it's time for Hartwig, Buchwald and Sonogashira. I guess Professor Whitesides is not likely to get it? I would have assumed he'd be under "lifetime achievement awards". Whitesides has always been a tough prediction for me. There are few people in the world - in any field of human inquiry - whose intellect and contributions I admire more, but in some sense I think Whitesides is a victim of his own success since he has contributed so extensively to so many fields that it would be really hard to single him out even for a lifetime achievement award. I think the one field in which he could have won the award more specifically was surface chemistry, and I was sorely disappointed when they did not recognize him along with Ertl. I think Whitesides will never get it. To be honest, I don't think he should get one anyways. Nobel recognitions usually is about one single "important" thing. Hard to find something like that in Whitesides' work. I really hope they hold off on a CRISPR-related prize for a few years. I’m sure there will be one eventually (as there almost certainly should be), but I feel like in recent years there have been quite a few physiology/medicine Nobel Prizes that were a bit premature, including the prize for RNAi. RNAi was and still is obviously a very powerful tool for research, but in many ways it may be superseded by CRISPR in the years to come and it still isn’t clear if there will ever be effective RNAi-based therapies for any major diseases. In my mind a prize for the discovery of miRNAs would have made more sense than one for RNAi. I guess a prize for the discovery of miRNAs is still possible (to Victor Ambros, Tom Tuschl, and David Bartel presumably… with Gary Ruvkun as the odd man out), but I doubt it’ll happen. Personally I think the Nobel Prize for iPS cells was premature as well. I guess I just don’t understand why there’s such a rush to award Nobel Prizes for work done in the last five to ten years when there are so many worthy contributions from ten, twenty, or more years ago that still haven’t been recognized by a Nobel Prize. Another thing that seems crazy to me is when a Nobel is awarded to a single person in a field that had many important contributors worthy of a Nobel Prize. For example, the 2006 chemistry Nobel to Roger Kornberg for work on eukaryotic transcription seems like a missed opportunity to recognize others that made major contributions to the field. Agreed. There's lots of very important and much better validated discoveries/inventions like cancer genes and DNA fingerprinting which need to be recognized. CRISPR can wait. I wrote my speculations including lengthy analysis of a possible CRISPR prize (though I think they will wait) and why there hasn't been a tumor suppressor gene prize for Weinberg/Vogelstein. Do you think there could be a Chemistry Prize for the cryo-RM revolution? Probably not this year, but in the future. Very interesting post, I definitely learned some things from it. Perhaps you're right about why there hasn't been a Nobel Prize for tumour suppressors yet... it's tough to pick only three recipients! Agree on Cryo-EM, just not yet. If you compare e.g. to the ribosome structure Nobel, which is certainly cool stuff but of limited relevance to the rest of science, cryo-EM technology has and will have a tremendous impact on a lot of (also biological relevant) structural biology. Nice list, especially the analysis of CRISPR and tumor genes. I also would like to strongly disagree Ash and GCC above on RNAi. Don't think of it just as a tool! It was a new and very exciting biology! Sure, it's definitely interesting basic biology, but I think the hype about RNAi-based therapies played a big part in why they got the Nobel Prize when they did. Time will tell if that really pans out. I do not necessarily disagree about the basic importance, just about the timing! I agree that it was unusually quick. But I also think RNAi was more exciting than many of the Lasker Award winning discoveries. I also think that waiting would not have changed the choice of the recipients (Mello and Fire). Weinerbeg should have won for medicine a long time ago. I hope he wins this year. Considering "biological" topics, I think chromatin biology should be awarded at some point. It has had such a big impact in many parts of biology and is central to understanding eukaryotic gene regulation. David Allis seems to a natural candidate there, but maybe also Michael Grunstein and Thomas Jenuwein. I am not too familiar with the field but it does seem like chromatin biology should be recognized at some point. I don't know if anyone is still reading this, but the following article tells an interesting story about the race to solve the high resolution nucleosome structure. Lithium ion battery should get it because of its huge implications in today's portable devices. However, this is not free of controversy with regard of who would be rewarded for it. Goodenough is a sure choice, but the other awardees could be Yazami and Yoshino, as the Draper prize previously recognized (https://www.nae.edu/Projects/Awards/DraperPrize/DraperWinners/105792.aspx). At least I was able to guess neutrino oscillations for the Physics Prize. I'm glad because I think the Super Kamiokande and the SNO teams deserved it.